Discovered 1909 by Max Wolf. This faint member (of only -14.7 mag absolute magnitude) galaxy of the Local Group was discovered in 1909 by Max Wolf, but its nature as a galaxy was figured out much later, by Knut Lundmark and P.J. Melotte in 1926. More recent investigations have fixed its distance at about 3.4 million light-years, somewhat farther away than the Andromeda galaxy (2.9 million light-years) and placing it in the outer regions of the region occupied by the Local Group [this value has eventually been corrected for Hipparcos data]. Previous estimates had even put it out to 4.2 million light-years; this would have made WLM one of the most isolated members, with its nearest neighbour dwarf galaxy, IC 1613, more 1 million light years away. The ESO astronomers recently obtained deep CCD images of WLM with the 3.5-m ESO New Technology Telescope (NTT) and the ESO Multi-Mode Instrument (EMMI). With the excellent imaging capabilities of this facility, they were able to see large numbers of individual stars in this galaxy. In this image, WLM appears to be quite elongated, and surprisingly, its largest extension is about 8000 light years or more than twice as large as thought before. Nevertheless, this is still 12 times smaller than the Milky Way galaxy. There is a clear excess of very faint stars that extends to the edge of the sky field covered by the NTT exposures. Some of these are probably foreground stars inside the Milky Way, but there are many more than expected, and their numbers increase closer to WLM. These stars look quite different from the ones in the central region of that galaxy: they are much redder and relatively faint; this is a strong indication that they are much older. 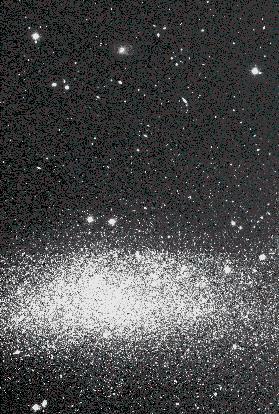 The distant stars thus appear to belong to an old halo around this dwarf galaxy. This shows that WLM must be very old, perhaps as old as the Milky Way, and in any case much older than indicated by the ages of the stars near its centre. The present discovery furthermore proves that a halo may also form around a dwarf galaxy, and it is not a feature exclusively reserved for large spiral galaxies. This photo is a reproduction from a combination of two CCD frames observed with the 3.5-m New Technology Telescope (NTT) and the ESO Multi-Mode Instrument (EMMI). The field covers an area of approx. 7.8 x 11.5 arcmin. 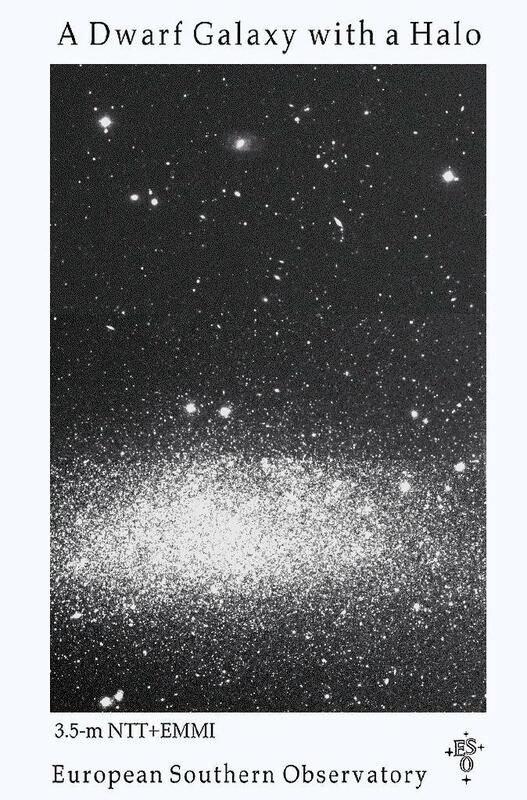 In the lower part is seen the WLM dwarf galaxy, fully resolved into individual stars. From these observations, this galaxy has now been found to possess an extended halo of which many stars can be perceived in the upper part of the field. A few background galaxies that are unrelated to WLM are also visible. At the distance of WLM, about 3 million light years, the field corresponds to a projected area of about 10,000 x 6,000 light years. The frames were observed in the near-infrared I-band and each exposure lasted about 45 minutes. The seeing was about 0.9 arcsec, and the faintest stars that are visible have an I-band magnitude of 24. In this reproduction, North is to the left and East is down. This photo was obtained by the European Southern Observatory (ESO). It may be reproduced, if credit is given to ESO. P.J. Melotte, 1926. New nebulae shown on Franklin-Adams chart plates. Monthly Notices of the Royal Astronomical Society, Vol. 86, p. 636-638 [ADS: 1926MNRAS..86..636M] Melotte states that this nebula was "also independently noted by Dr. [Knut] Lundmark when examining the same [photographic] plates." Max Wolf, 1909. Über einen größeren Nebelfleck im Cetus. Astronomische Nachrichten, Vol. 183, No. 4380, col. 187/188 [ADS: 1909AN....183..187W].